The Bowmanville neighborhood, located in the Lincoln Square area of Chicago, has been a leading example of community-driven open land preservation. Comprising just over 1,500 households, the neighborhood has worked with the City of Chicago and environmentally focused not-for-profits since 1996 to create shared green spaces. Bowmanville’s four small community gardens have earned regional accolades, public and private grants, and multiple media spotlights. In the late 1990’s, a group of dedicated Bowmanville neighbors banded together to clean up a narrow strip of land along the Metra tracks that was little more than an eyesore. The strip was littered with tires and choked with weeds, and was a destination for illegal fly-dumping. After successfully clearing and cleaning the land, the Bowmanville Community Organization (BCO) partnered with Chicago not-for-profit NeighborSpace to establish a community food garden. In 2008 with support from 40th Ward Alderman Patrick O’Connor, the BCO was granted permission to install 20 raised beds, as well as a picnic table and pergola, on the land. 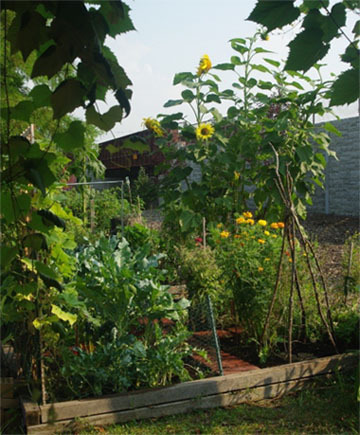 The current garden, which serves over 40 gardeners, sits on a public right of way and is maintained by community volunteers who donate their time, sweat, and financial contributions to make the garden flourish. The Gateway Garden hosts residents of the Bowmanville, West Andersonville, and West Edgewater neighborhoods, as well as gardeners who work along the revitalized Ravenswood Industrial Corridor and beyond. The narrow private parcel located between the Gateway Garden and Metra rail tracks is privately owned and has been for sale, touted as a prime development opportunity in the burgeoning Andersonville/ Lincoln Square area. If this property were to be sold, not only would the gardeners lose access to the public land on which they grow, Rogers Park Montessori School would lose the teaching plot that serves as an outdoor classroom for the school’s nascent food gardening program, and the neighborhoods of Bowmanville, West Andersonville, and West Edgewater would lose much needed open space. In response to this threat, the BCO has partnered with NeighborSpace to acquire the private parcel and expand the Gateway Garden into a forum for urban agriculture and community building. The BCO’s offer was accepted on the condition that funds for the purchase price be raised by the end of summer 2017. The BCO and NeighborSpace are working together to secure funds from both public and private sources. Full funding is contingent on the community raising its share– $50,000– to acquire the land and build out the vision.